XLPAT will take its next leap of success with the development of the new R&D module that aims to foster innovation and create inventions. Through an automated analysis, using technologies like Natural Language Processing, Machine Learning, Artificial Intelligence, 3d analytics, on Patents and will support research and development units of companies and research organizations, universities, individual inventors and researchers in understanding the current innovation trend and the grey areas within a technology. 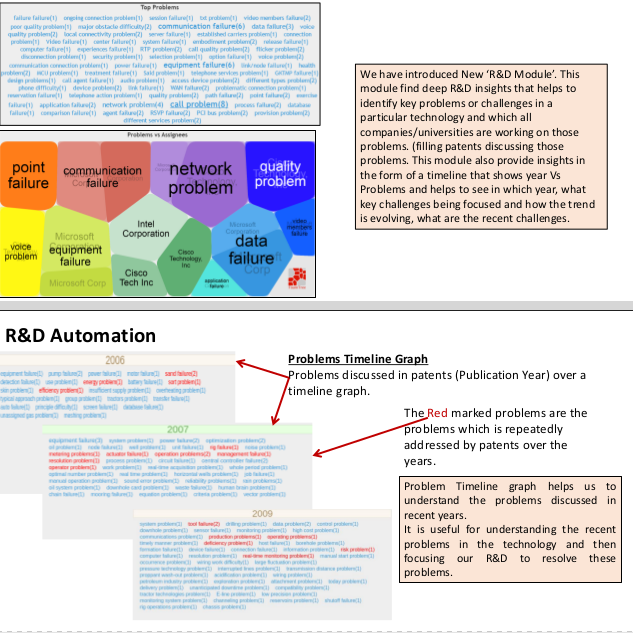 R&D module interprets all information contained in patents in a graphical format to provide quick insights about what problems/short-comings in a technology are being addressed by different technology documents, which companies are working on what problems, conceptual analytics, products/components claimed, year wise trends of different concepts, what are the fundamental patents in a technology and the worth of such publications and much more. Such information will be helpful in making critical R&D decisions and guide future investments and research initiatives like what particular areas of the technology should lead their R&D. This will eventually help companies in developing new and better products and facilitate expansion of existing product lines. See grey areas within a technology.